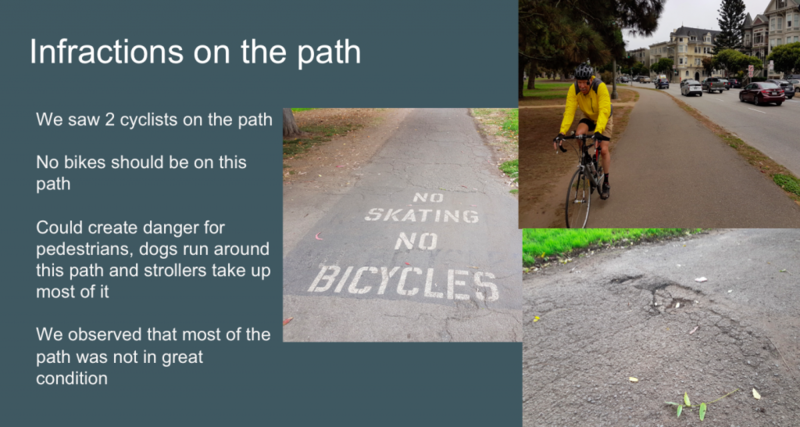 Slide presenting evidence about the pedestrian path in San Francisco’s Panhandle. We’ve been studying the Panhandle, and it turns out other people have been studying it too. Over the past 100 years, the Panhandle has changed from a parkway for automobiles to a car-free extension of Golden Gate Park. The streets bordering the Panhandle, Fell and Oak, have changed from quiet neighborhood streets to wide, high-speed expressways. Now there are plans for further changes–but what should those changes be? Like our class, different groups have been trying to collect information that will help us make the best decisions. Read this post on Streetsblog San Francisco about the controversies that have arisen. Post a comment here — thinking particularly about evidence, how would you address this problem? From what I’ve seen, there is a combination of both pedestrians, skaters and bicyclists on the panhandle. Everyone seems to be managing their time and path effeciently, with no trouble or collisions. The protected bike lane, in my opinion and based on the evidence provided from Streetsblog, is only for commuters. The blog isn’t necessarily promoting this for the safety of the people using the panhandle, but for the increase awarenesss of commuters that pass through Fell and Oak. Based on the evidence that the article provided and from what I have experienced, the Panhandle has so much potential to offer as a well rounded place and I don’t think we are using it to its fullest. I would address this problem by going through with the protected bike lane that the article brings to attention, and maybe have a speed tracking device that tells bikes how fast they are going. If it is below a certain speed, there could be a merging lane going out of the protected bike lane, into the Panhandle road lanes (where we usually ride), so that the protected bike lanes can be used for commuting individuals or people going to different places. The people below the speed will be using the black road Panhandle lane to have a more leisurely stroll, and then the walkers, joggers, skateboarders, etc. could join in that lane as well.